The fantastic show Le Reve Las Vegas playing exclusively at the Wynn Resort and Casino. This show combines many unique features that are only performed by the highly skilled acrobats, dancers, divers, singers and swimmers. The mystical atmosphere that is revealed during the show will bring guests to a dreamy mindset wondering where their sleep will take them tonight. The Le Reve is an electrifying stage show that has been voted the Best Production Show in Las Vegas for the last five years straight and creator Fracone Dragone continues to add new creative segments on a regular basis. The Le Reve Las Vegas will take guests through an unexpected mystical underwater experience that includes an extremely choreographed performance. The show opens with a man and woman departing from each other after a pleasant evening of fun. As the man exits the young lady begins to fall asleep on a bed centered on the round stage. As she falls sleeps the bed slowly disappears and the magical moments of her vibrant dreams are about to begin. Tip: Non-flash photography is allowed during the show. As the show progresses a beautifully adorned platform rises above the stage where a diver will perform a perfect swan dive into the sparkling water. Once in the water the dreaming woman and the diver perform an exquisitely timed tango dance enhanced by dancers on the inside platform. The beautiful movement of the swimmers/dancers while underwater and on stage has been known to leave patrons speechless. Another segment may include mystic creatures that appear around the theater with aerial acrobats emerging from the ceiling. The two groups will meet on a stage that is surrounded by a pool of fire rings. As the stage is drenched with rain showers the fire rings subside and change into a gorgeous tree. The acrobats and mystical creatures then begin diving into the surrounding pool area while performing spectacular aerial tricks before entering the water. These are just examples of what to expect from the agility that these artistic performers exhibit on the stage and in the water. Many times throughout Le Reve the synchronization of the acrobats, aerialists, dancers, divers and swimmers will delight patron’s eyes. The costumes enhance the many moving plots that change seamlessly from one to another scene during Le Reve. There are forty costume changes during this seventy-five minute show that involves ninety-one different performers. The 2,000 plus wardrobe items are meticulously designed and chosen for special effects during the show. The Wynn Resort boasts the only aqua theater in Las Vegas. With this unique round theater layout no one has a seat that is further than forty-two feet away from the stage in this 1,600 seat theater. The stage is a fabulous mechanical setup that involves several rising platforms situated on stage that is positioned strategically within the sixty-eight foot in diameter pool area. Underwater performers utilize the one hundred hookah style oxygen intakes in the twenty-seven foot deep pool to enable themselves to stay under the water. Le Reve Las Vegas includes spectacular visual effects that are combined with an intricate light show. The coordinated music enhances the performance of the spectacular dancers and swimmers that move effortlessly throughout the choreographed stage show. The incredible artistry that is portrayed on stage and in the water is a once-in-a-lifetime experience. Le Reve Las Vegas best seats: The performance of Le Reve Las Vegas is located within the Wynn Resort and Casino complex at the exclusive Wynn Theater. The round center stage surrounded by water offers excellent sight views for the guests. Seats get more expensive further away from the stage. Plush seats include Poolside, Grandview, Dream, Golden circle. Keep in mind that seats closer to the stage are known as a "splash zone" - you might get wet. Also, a lot of action if taking place high in the air, so if you have a bad neck, seats further away from the stage are recommended, so that you don't have to look up all the time. Otherwise, Poolside seats are just fine. Le Reve Las Vegas is a creation of Franco Dragone who was born in Italy. He has created and produced many shows that involve daring physical artistry from his performers. Dragone has a list of accomplishments that include his productions of The House of Dancing Water, The Han Show and Taboo as well as his work with Cirque du Soleil and singer Celine Dion. Patrons must be five years of age to attend and persons under the age of eighteen must be accompanied by an adult. 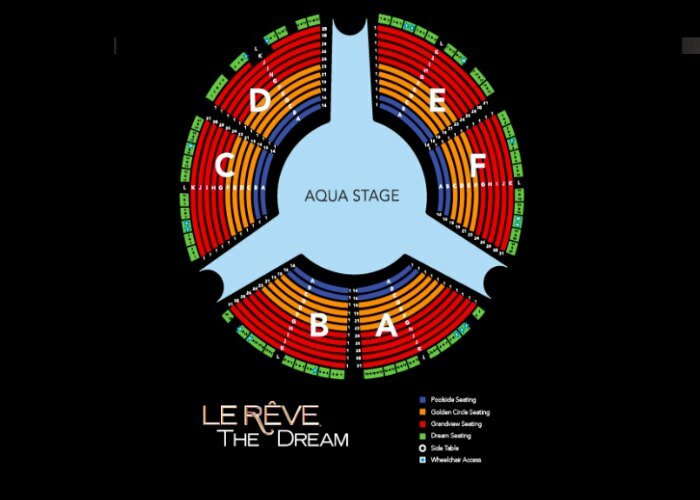 Le Reve Tickets are on sale now with a choice of Poolside, Grandview, and Buffet + ticket special.